I am at the age of having… A lot! So I am always telling people if you insist on getting me a gift please make it consumable…i.e. food, pedicures, massages. 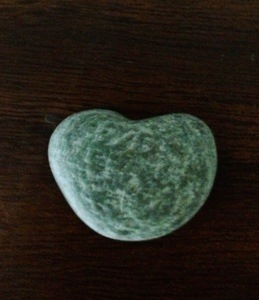 People tend to send me unusual pictures of hearts… Saying it makes them think of me, and I am always extremely flattered! My dear friend returned from her Italy trip and brought me back a special gift… She knew my consumable rule and knew that would be tuff being in Italy… But what she did was priceless to me… She was on the beach in Capri Looked down and saw a stone in the shape of a heart and knew she had to give it to me… Well I cried when I received that special gift… It’s one of my favorite gifts of all times. For two reason… First it’s a heart from Italy and she thought of me when she saw it! And second it’s from Italy a place I will someday be standing holding that heart shaped stone thinking of my dear friend Lisa! There’s a writers conference in Pisa Italy in one month I wonder if I will get there? Want to send me for my birthday?